Salvador da Bahia is an extremely energetic and lively city, with its historic centre being packed with colonial architecture dating from both the 17th century and the 18th century. Capital of the Brazilian state of Bahia, Salvador was actually once the capital of the Portuguese New World colony and today is known for its outstanding arts movement, brightly coloured painted buildings, exciting festivals and Afro-Brazilian character, as well as its glorious tropical beaches and sweeping coastline. Over the past couple of decades, Salvador has heavily invested in its Pelourinho neighborhood, successfully restoring the architecture and revitalizing the entire city. Salvador is widely considered to be the principal tourism hub of North-East Brazil and is second only to the legendary city of Rio de Janeiro in terms of the country's most popular and visited cities. Bahiatursa serves as the city's local tourism agency and features tourist information outlets with multilingual staff in the principal districts of Porto da Barra and Pelourinho, as well as at the Shopping Barra complex, the Mercado Modelo market, the bus station (rodoviaria) and Deputado Luis Eduardo Magalhaes Airport. Central Salvador is best experienced on foot and many of the leading tourist attractions are within easy walking distance of the top beaches, often being based around the main public squares, such as the Largo do Pelourinho, the Praca Quincas Berro d'Agua, the Praca da Sé and the Terreiro de Jesus. The Praca da Sé is where you will find the Plano Inclinado Goncalves (Goncalves Funicular Railway), which provides a handy way to travel between the Comercio neighbourhood and Pelourinho. Also connecting the Cidade Alta (Upper City) is the very stylish and elegant Elevador Lacerda (Lacerda Elevator). Much green space is available in Salvador, should you favour recreational activities away from the beachfront, with the Jardim dos Namorados, the Parque de Abaeté, the Parque Costa Azul and the Parque de Pituacu all being particularly pleasant spots. Soccer fans timing their visit correctly may be able to take in a football match at the Estádio Fonte Nova (Fonte Nova Stadium), where many other events are also hosted throughout the year. More information about Salvador Tourist Attractions. Founded in 1549, Salvador is certainly a city with a rich history and its strong Portuguese roots are very apparent in the colonial architecture of the oldest buildings. The Catedral Basilica is of great local importance, as are the churches named the Igreja e Convento Sao Francisco, the Igreja de Nosso Senhor do Bonfim, the Igreja Nossa Senhor do Rosário dos Pretos and the Igreja da Ordem Terceira do Carmo. Presiding over the Praca Municipal is the Palacio Rio Branco, which is amongst the most historic of all Salvador's landmarks and is actually one of Brazil's oldest palaces, once being home to the offices of the country's very first governor general, Tomé de Souza. The numerous fortresses of Salvador also stand out as important monuments to the city's past and stand on the coastline, being built around Barra to provide fortifications ready to defend the city against a Dutch invasion. More information about Salvador Landmarks and Monuments. Offering a cultural alternative to the beach fun and water sports, the museums of Salvador provide information about Bahian history. The best include the Museu da Cidade (City Museum) and its sacred local artefacts, and the Museu de Arqueologia e Etnologia (Museum of Archaeology and Ethnology), where various excavated relics are displayed. Overlooking the Baia de Todos os Santos (Bay of All Saints), the Museu Nautico da Bahia (Nautical Museum) comprises both a military fortress and a lighthouse, and celebrates Salvador's rich maritime heritage. Local Bahian artists often exhibit their creations at the Museu de Arte da Bahia - MAB (Bahia Art Museum), with the Museu de Arte Moderna (Museum of Modern Art) being another gallery of note and packed with contemporary Brazilian masterpieces. More information about Salvador Museums and Salvador Art Galleries. Bahia remains the principal tourist destination in North-East Brazil and as such, it cities and towns are overflowing with sights to see, seasonal celebrations to enjoy, and regional cuisine to savour. Various beaches and islands are easily reachable from Salvador, being spread along both the Coconut Coast and the Dende Coast. Residents of the city often choose to spend time on the nearby Ilha de Itaparica, and this island's coastline is now lined with holiday homes. Other islands suitable for excursions include the Ilha Bom Jesus dos Parros, the Ilha dos Frades and the Ilha da Maré, all of which are well connected by boat. To the north-west of Salvador, the twin towns of Cachoiera and Sao Felix warrant investigation and are steeped in colonial history. 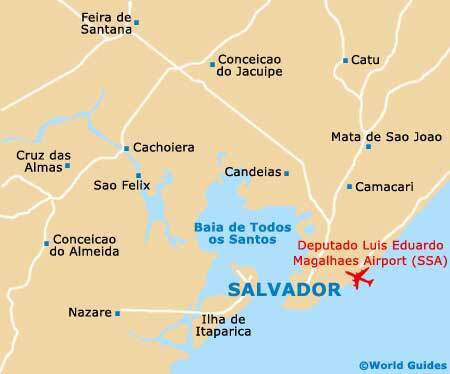 More information about Salvador Attractions Nearby.